“Eisenhower” by Geoffrey Perret was published in 1999, two years after the publication of his biography of Ulysses S. Grant. Perret is an author and historian and served for three years in the U.S. Army. Among his dozen published books are biographies of JFK, Lincoln and Douglas MacArthur. Perret’s biography was the first comprehensive review of Eisenhower following the publication of Stephen Ambrose’s two-volume series in the early 1980s. With 608 pages of text it provides substantial, but not exhaustive, coverage of the thirty-fourth president. “Eisenhower” proves an easy, fluid read that lacks the weighty feel of more academically-oriented biographies. As a result, readers new to Eisenhower will find this an efficient and often engaging introduction to a man whose public career does not naturally lend itself to a lively, buoyant narrative. The author’s military background (and predilection) is frequently evident and underpins some of the book’s most interesting features. Among these is Perret’s analysis of the difference in British versus American styles of military command and fascinating discussions relating to the logistics of war and the use of advanced technology by the Allies. Although Perret’s review of Eisenhower’s cabinet appointments seems perfunctory, his discussions of the earliest days of Ike’s presidency and leadership style and the dynamics of his cabinet are quite compelling. In addition, Perret’s introduction to Secretary of State Dulles, his assessment of Earl Warren (and the Supreme Court’s legacy during that era) and his review of the Cold War prove interesting and robust. But for all its strengths, Perret’s biography of Dwight Eisenhower possesses several notable shortcomings. Most significant among these is the fact the book promises an original, provocative portrait of Eisenhower…yet it is entirely unclear this promise is ever fulfilled. If fresh perspectives of Eisenhower are revealed in these pages they are well-camouflaged. In addition, Perret’s review of Eisenhower’s youth and early military career is competent but far too brisk; Ike is nearly fifty years old after just one-fourth of the book has elapsed. The pace slows substantially when Eisenhower is selected to lead the Allied invasion of North Africa in 1942, but by then numerous opportunities to more fully flesh-out his character and personality have been missed. If one of the book’s notable strengths is the ease with which readers can absorb Eisenhower’s life, one of its key weaknesses is that it often lacks the feeling of serious, probative history. While this biography is filled with soft observations on Eisenhower’s explosive temper and daily routine there is ultimately a dearth of penetrating, insightful facts and observations to explain his successes and failures as Supreme Commander – and president. The reader sees much of the chain-smoking, carefully guarded and loyal Eisenhower in the book’s forty-five chapters…but never really gets inside his head or understands what truly makes him tick. His personal life is never seriously examined and his family often seems an after-thought (which, in fairness, it may have seemed to Eisenhower as well). And while his post-presidency is relatively well-covered in the mere eight pages it receives, there is very little concluding discussion of his legacy or lasting impact. 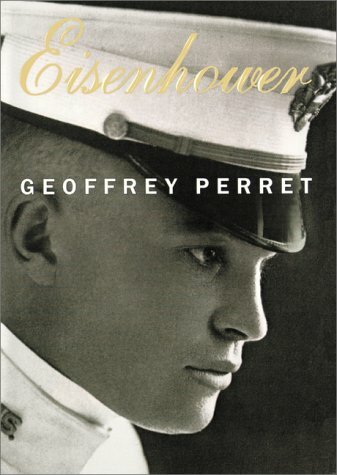 Overall, Geoffrey Perret’s “Eisenhower” is good in numerous ways, but excellent in virtually none. While providing comprehensive coverage of this soldier-president in an easy-to-digest and often interesting manner, it lacks the rigorous examination and analysis that is embedded within the best presidential biographies.